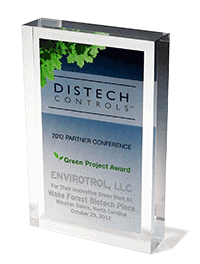 Distech Controls, an innovation leader in building automation and energy management solutions, awarded its annual Green Integrator award to Envirotrol, LLC. Each year, Distech selects an outstanding integrator that has shown exceptional aptitude and knowledge in providing solutions for facility operation that are reliable and maximize building energy efficiency. Envirotrol was selected for its work at the Wake Forest Biotech Place in Winston Salem, North Carolina. Wake Forest Biotech Place, a former tobacco warehouse and machine shop was redeveloped into a 240,000-square-foot research lab and classroom facility by Wexford Science +Technology and achieved LEED Gold certification established by the U.S. Green Building Council and verified by the Green Building Certification Institute. In delivering an energy efficient solution for this project, Envirotrol incorporated both direct integration of mechanical and electrical equipment and Distech Controls to provide a best in class solution for a Chilled Beam HVAC controls system. By integrating energy usage metrics into the facility management system, Envirotrol is providing real-time energy usage information to help the client manage peak facility performance while maintaining reliable and dependable operations.